D’Olyfboom Estate in Paarl, in the heart of the Cape Winelands, offers exclusive venue hire at a breathtaking boutique wine estate – just a stone’s throw from Paarl village centre. D’Olyfboom, a 40 hectare family estate situated on the outskirts of Paarl, is typified by olive groves, flourishing vines and warm hospitality. The estate nestled against the hillside and overlooking the vineyards and magnificent Paarl Mountains, is home to a charming old Cape-style designed venue and Rudera boutique wines. Imagine the intoxicating scent of lemon trees, the sound of natural water streams and the warm evening breeze during your summer wedding, Or for a winter wedding you might like to have your reception inside the grand Optenhorst walls, enjoying a cosy crackling fire while sipping a glass of estate produced boutique wine. Our venue comfortably seats up to 80 guests and caters for couples seeking authenticity and privacy in a nature orientated setting with touches of luxury. Superbly situated in the spectacular Cape Winelands, D’Olyfboom promises tailored personalised service complimented by the farm’s charming heritage dating back to 1693. 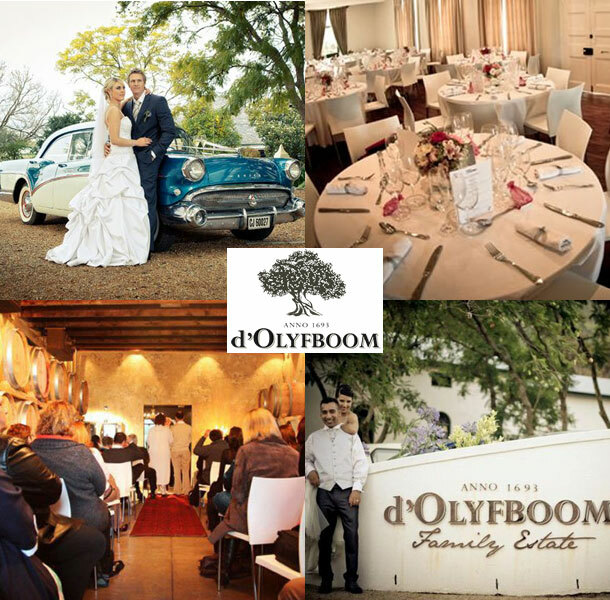 The beautiful vineyard, garden and Paarl mountain views makes D’Olyfboom an enchanting and ideal setting for a wine country wedding, conference or function. Allow us to make your day a memorable and magical one. To book your wedding at this gorgeous venue telephone Marais and the team on +27 (0)21 870-1080. Alternatively for further details or to send an enquiry visit d’Olyfboom.